More state senators. 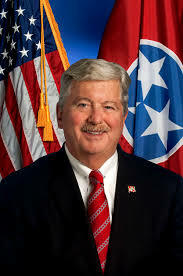 James Rand McNally is a member of the Tennessee Senate (not exactly a hotbed of reason and rationality), representing the 5th District, and the 50th and current Lieutenant Governor of Tennessee since January 2017. McNally is a member of the Religious Right, and is a firm opponent of the separation of Church and State. For instance, in 2013 McNally introduced bill SB 965, which would make it virtually impossible for citizens to protest violations of the separation. Indeed, the bill would make such complaints in practice illegal, since it would be illegal to engage in writing “with a local government unit or local public servant in a repetitious manner” with the intent to persuade them to change policies like prayer before meetings if such letters include “a threat of initiating legal action against the local government or local public servant challenging the particular policy, practice, action or custom.” Yet it would, of course, also be impossible to file any complaint without engaging precisely in such exchanges. And just to be clear: McNally aimed to impose such limitations on federal courts. Of course, the bill would rather explicitly contradict the part of the First Amendment prohibiting denying people the right of people to petition the Government for a redress of grievances. McNally, of course, is firmly opposed that Constitution, though like most religious fundamentalists who hate the fact that the Constitution prevents instituting theocracy, would vehemently deny that he is opposed to it. McNally is also vehemently opposed to what he perceives to be “a movement to target people of faith who are being nominated,” which exists only in his head but which he thinks characterizes the Democratic party. The Democrats “want their own, either agnostics or people who are non-Christians.” Politics is really a war between Jesus and the Left/Satan. Diagnosis: Perhaps “theocrat” would be an exaggeration, but McNally is certainly an ardent opponent of the separation of church and state. He’s also a powerful guy. Be wary. No, "theocrat" is not an exaggeration.